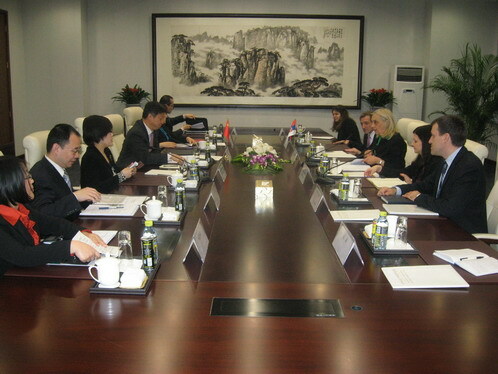 (Beijing, 21 April 2013) The State Secretary of the Ministry of Foreign Affairs of the Republic of Serbia Mrs. Vera Mavrić visited People's Republic of China 18-21 April 2013 as head of the delegation at the regular political consultations between the Ministries of Foreign Affairs of the Republic of Serbia and the People’s Republic of China. During the consultation with the Vice-Minister of Foreign Affairs of China Mr. Sung Tao on the 19 April, the two sides exchanged views on the status and prospects of further development of strategic relations between the two countries, first established by China with one of the countries of South East Europe, and Central and Eastern Europe. The talks confirmed very good political relations, agreed to continue the exchange of high level visits and mutual support in the issues of national interest of the two countries. The two sides discussed the specific modalities of cooperation in the economy, especially the infrastructure, energy, agriculture, tourism and culture, education and other matters. State secretary V. Mavrić and Vice-Minister Sung Tao exchanged views on China's cooperation with the countries of Central and Eastern Europe, as well as new models for strengthening relationships. During the visit, V. Mavrić was received by the Minister of Foreign Affairs of the People’s Republic of China Mr. Wang Yi. In a cordial meeting, the good basis for the further development of bilateral relations, mutual readinesses for further development of strategic partnership and strengthening cooperation on international issues were emphasized.